Check out the latest news from Intown Quilters Fabric & Yarn! Please enter your email address below to sign up for our mailing list. You'll receive an email with a 10% off coupon when you register. It's Thanksgiving week and we are thankful for so many things, but especially for you. Thank you for being part of the IQF&Y family! We're kicking off our Black Friday deals early this year! Shop our sale beginning Tuesday, 11/20, from 9:30 am-8 pm and continuing Wednesday, 11/21, from 9:30 am-2 pm (note our earlier closing time). We're closed Thursday, 11/22, for Thanksgiving, and resume our regular hours when we re-open Friday, 11/23, at 9:30 am. Our sale continues through Sunday, 11/25, at 4 pm. What are the deals, you ask? 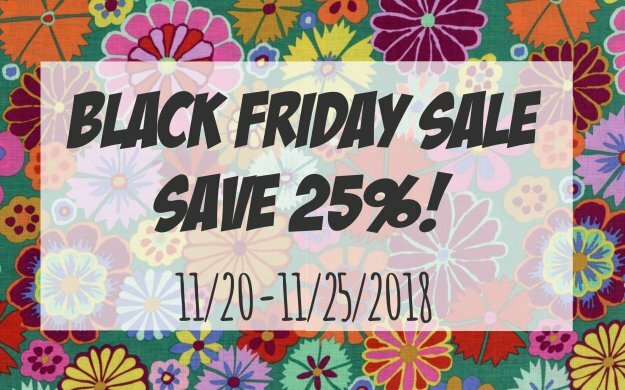 Well, we decided to make it simple: Everything in the store is 25% off*! Plus, receive a free gift with every $50 spent. *As always, no additional discounts apply. Join us for Small Business Saturday on 11/24, celebrating small businesses like ours and backed by American Express. It wouldn't be a celebration without customers like you! Grab a friend or family member and come on by the Saturday after Thanksgiving. We'll have a special Small Business Saturday canvas tote bag for the first folks in that day and some other little surprises, too. It's a great excuse to show your love for your local quilt shop (that's us!). Interested in a one-on-one experience? We also have several teachers who can schedule private lessons for sewing, quilting, knitting and crochet. Email us for more information. Our regularly scheduled Sit & Knit will not be held this week due to the Thanksgiving holiday. We will be collecting Toys for Tots again this year. Please consider gathering nice, new toys to bring in to the shop to donate to this program. Sarah & the IQF&Y crew!